Outdoor's in an extension to the indoors. 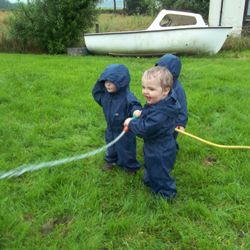 We provide all weather clothing for children of all ages which enables them to access the outdoor's whatever the weather! Right at the centre of nature! We provide a safe place where each baby receives individual attention from caring staff that follow the same comfortable routine as you do at home. Key-Workers provide essential attachments that your baby needs to feel secure. The infants have their own sleep room which is a quiet and relaxing area for them to rest and sleep following their individual routine. We support your child’s rapidly developing skills and physical abilities with encouragement to learn new words, to improve coordination and to work with you as parents to teach personal, social and emotional skills through play with other children and adults. 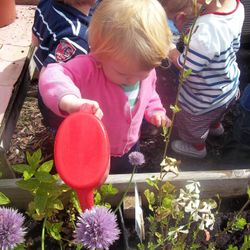 Toddlers love to explore and investigate everything, learning all about their environment and how things work. 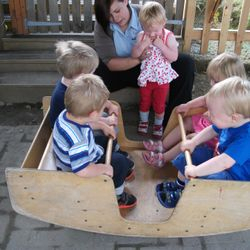 The toddlers love to be outside.We provide a free access area where they can experiment with their developing physical skills. The two’s explore a wide range of developing skills. 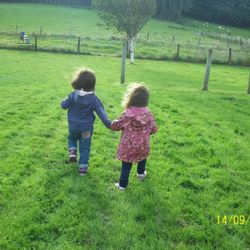 Friendships blossom and the children begin to discover more about their feelings and the feelings of others.They are encouraged to apply their developing independence and we celebrate their achievements and share these with you along the way. Fascinations and their interests are key to our planning process engaging the children in their learning. Children enjoy a wide variety of activities, which creates the desire to think for themselves, solve problems, work with others and gain an increasing understanding of the world and how it works.With an emphasis on language, pre-writing skills and maths, working all the time with you as parents to help your child’s development and preparation for school. 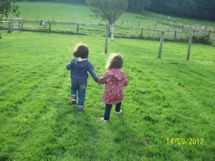 Friendships, fascinations and interests deepen and children’s learning styles become more apparent assisting staff in planning for your child. 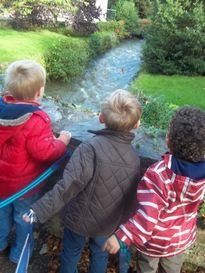 Free access to the outdoor area is available giving children the opportunity to learn both indoors and out! We provide extra-curricular activities to enhance the children’s learning. The children have an opportunity to work in small groups on focused tasks during our Cookery and Gardening Club. 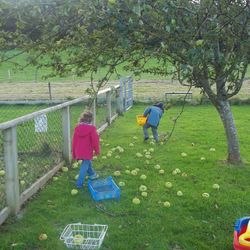 The children participate fully in planting and caring for plants, growing, preparing, cooking and tasting their own fruit and vegetables as well as cooking a variety of food. The learning opportunities are endless!